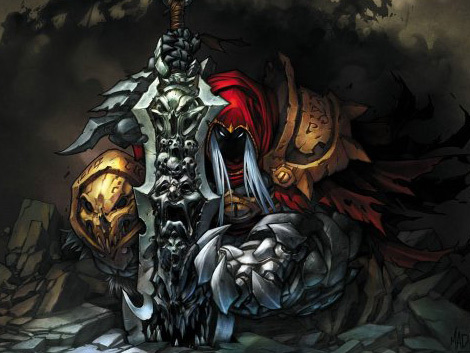 I’m rather chuffed with myself I have to say -I completed Darksiders over the weekend! Yay me!I think this is actually the first game in a long while that I’ve just sat down with the aim to complete a game, outside of the fact that I had it for review or whatever. I’m not much of completionist as you may have picked up on by now. Story driven games like Darksiders pull me through the most, but then I’m liable to get bored if the game mechanics are too boring or grindy, which was in danger of happening here but the key difference I think is that I had a purpose. You may remember I was in Amsterdam a couple of weeks ago seeing the sequel, and in preparation for that I actually read up on the first game. Kind of spoiled the ending for myself, but it actually sounded like a decent, iconic moment for a videogame, and so as soon as I got back I bought it from ShopTo.net (GAME were out of stock), and the sometime last week I think I started playing it – doing a couple of hours every night before marathoning it during the Easter Weekend to finish it off. It’s weird – knowing the ending beforehand gave me an end goal, a reason to put up with the oddities, the repetitions, and the rushed plot devices that littered the game, and when I got to that scene I wanted to see (which I probably could have easily looked up on YouTube), I had a real sense of achievement. More so perhaps than if I didn’t know what was coming. It was definitely worth it, and I don’t mean to make Darksiders sounds rubbish, because it really isn’t. Other people I talked to said the first hour or so was really boring, and I could kind of see that but again I knew what the game was about, and I knew where I was headed so it was easier to bear – perhaps foreknowledge really isn’t such a bad thing after all. It’s a shame really that the second game isn’t going to continue on from that ending – it’s very much a “Can’t wait to see what happens next” moment, but given that the first game was a tentative first step into a new IP, the second is going to expand on the universe and the lore more, and then probably bring it all together for the third game where they’ll continue on from there. Assuming THQ survives long enough to help Vigil get a third game. It’s like I said in my preview though – parallel stories are a dangerous thing, and I hope it doesn’t prove to be too tenuous a link to the original game – but it does have to account for the time of the other three horseman whilst War was incarcerated for 100 years at the beginning of the game. One of the game’s leads mentioned to me in an interview that they’d gone into the first game very much with a sequel in mind, and you can see that with the amount of loose ends they leave. I doubt I’ll pre-order it though – too much potential to disappoint right now for me to commit financially for it, plus I’d like to get it for review if possible, but being freelance now there are even less guarantees. Hope you all enjoyed your Easter.